A sacrifice area can be used to secure animals while stalls are cleaned in the barn or routine maintenance (dragging, clipping, etc.) is completed. 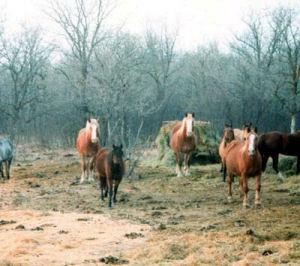 The use of a sacrifice area could result in increased pasture productivity because it gives you a place to keep the horses when you need to keep them off the pasture. For example pastures cannot survive continuous grazing and trampling during non-growing seasons, winter and droughts. Other situations where they are useful are; when the ground is muddy, when there is frost on the grass, and anytime the grass needs rest like after grazing. Sacrifice areas should be located as far away from wetlands, surface water, and wells as possible. They should not be located in drainage flows, such as ditches, and preferably on a level area at the top of a hill. Sacrifice areas should be surrounded by a thick stand of grasses that can filter sediment and nutrients washed from the sacrifice area. A common way to do this would be to have the sacrifice area surrounded by pastures that may be used for rotational grazing. Manure should be collected from a sacrifice area for disposal. The sacrifice area should be located close enough to the manure storage area to improve the ease of collection. Since these areas may not be vegetated, they are likely to become muddy in wet or inclement weather. Wood chips, sand, and/or gravel, or even concrete may be used to provide an improved foundation and keep the area small. Feeding, watering, and shelter areas that are in the sacrifice area should have appropriate foundations surrounding them to prevent erosion from hoof traffic. They should be only as big as absolutely necessary if vegetation cannot be maintained in the sacrifice area. Because of substantial wear and tear, these areas will be sparsely vegetated; grass cover may be nonexistent. Sacrifice areas should be large enough to provide exercise for the animals using the area. Horse Facilities Handbook, by Midwest Plan Services recommends that pens be at least 1,000 square feet per horse. Don’t forget that appropriate fencing, some sort of shelter from the elements and water are necessary for horses as well. There are two strategies to sizing and maintaining sacrifice areas: either keep the area just large enough for the needs of the animals and accept the fact that the lot surface will be bare, or use a large sacrifice area that is large enough to maintain a vegetative cover. The latter is preferred for environmental reasons. Confining animals for more than 45 days in the sacrifice lot can define the area as an animal feeding operation. If that area has a connection with surface water, such as a stream or ditch running through it, or if it discharges to a water body and is deemed to be a significant risk to surface water by the state regulatory authority, the operation may be required to control the runoff from the exercise lot and obtain permit coverage. Therefore, it is strongly urged that producers manage their exercise lots and sacrifice areas as seasonal or temporary use, primarily keep animals on pastures, and not locate them in environmentally sensitive locations so as not to impact surface waters. Could Part of My Pasture Operation be an AFO?